I received an invitation to meet with Jimmy Stafford, lead guitarist of the music group Train last Tuesday evening, August 6th at the Isleta Amphitheater just south of Albuquerque. 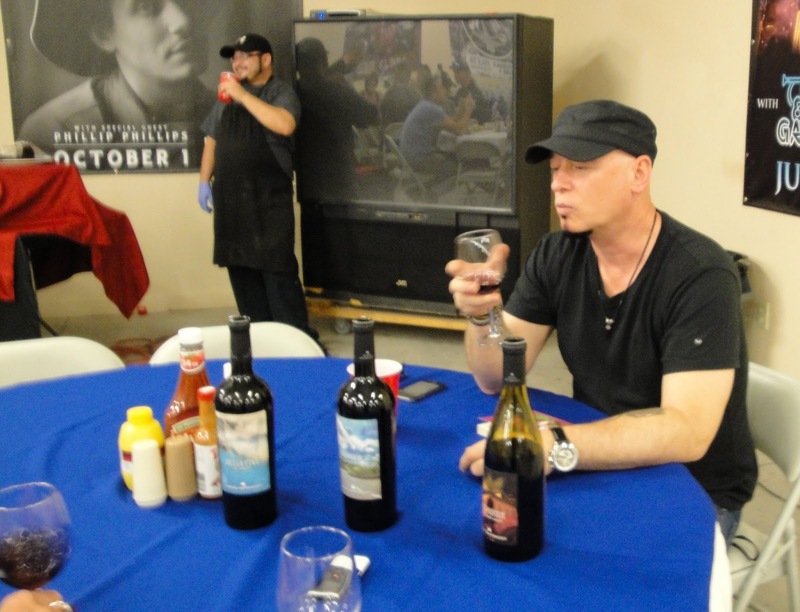 The band also has a wine company, Save Me, San Francisco Wine Company and the idea was for us to try some of the wines and chat with Jimmy before the show. OK, let’s add it up; San Francisco, wine, music, meet a guitarist. That hits many of my hot buttons. Being a guitarist myself, I’ve never met a guitarist I didn’t like, to paraphrase Will Rogers. I was a little leery about the wine, however. Names like Calling All Angels Chardonnay and Drops of Jupiter Red, do not always instill confidence in me, unless I’m dealing with Australians. They seem to thrive on weird names for their wines. Never having been to the Isleta Amphitheater, I was not sure how this would work out. I was imagining a huge drive-in movie style stage and backdrop with seating in front, but where was the backstage? Getting off the Rio Bravo exit of I-25 I was also worried to see so many cars. I was afraid they were all going to the concert. They were. Would we make it in time? I had heard comments from folks who had been there that it was difficult to get in and out of the complex. Arriving at the entrance, we were escorted down behind the stage to an outbuilding, which was where acts could relax, get refreshment, and hang out. There at a large circular table was Jimmy with three bottles of wine and glasses set up. As it happens we had plenty of time to talk and Jimmy was very generous with his time. In fact, we talked, drank wine, and conversed like old friends getting back together. An hour flew by on fleeting wings. This was way better than I had imagined. And so were the wines. Tasting the 2011 Soul Sister Pinot Noir, I relaxed and smiled. The wine tasted much better than its $12 price tag, with tarry notes (that’s a good thing by the way), dark cherry, with some good spice, fine tannins and good mouthfeel. It also had good typicity, a term that replaces “varietally correct” to identify authentic grape characteristics. Re-tasting the Pinot Noir, Jimmy said, "I'm liking this much better than when I first tried it." When we arrived, I had given Jimmy a copy of my wine book, Wines of Enchantment, which includes a good primer on wine fundamentals and advanced topics. When I mentioned typicity he asked, “Is that in your book?” Clearly Jimmy is learning about wines at an accelerated pace as the band’s spokesperson. He also approves the wines or blends used. For one wine there were 5 lots or samples for Jimmy to try; A to E. He chose E, which the winemaker considered the best, so he does possess a good wine palate. Jimmy has been drinking wines before each of his concerts for some time. It is his ritual for getting ready for a concert and even mentioned on their website. That’s another use for wine I had not previously considered; relaxing before going on stage. Since I operate as wine server when I do wine classes, I am not allowed to taste the wine according to state laws. Otherwise I might try this out myself. We next tried the 2010 California 37 Cabernet Sauvignon, while Jimmy checked the label. When he had first read the winemaker tasting notes, one of the terms used was hints of tobacco. Jimmy said, “I don’t even smoke, is that good thing for a wine?” I assured him it was a highly-prized element in the nose of a wine. I mentioned it is a characteristic of some great Bordeaux wines and people pay big bucks for that. The Cab was more refined than I expected at its price point with good structure and depth, and good fruit structure. James Foster, the winemaker, is doing an outstanding job with their wines considering the price point and variety of wines Save Me, San Francisco now offers. The last wine we sampled was the 2010 Hella Fine Merlot, which had good earthy spice normally found in much more expensive wines. They have sold over a million bottles of their wines this year alone. Proof this is not a vanity or souvenir wine, but the real deal. 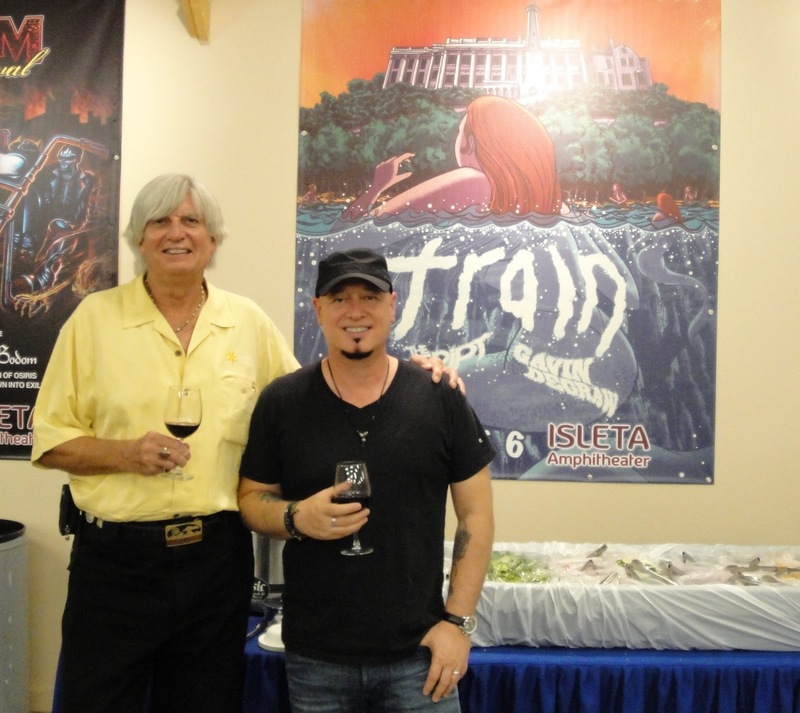 If you are a fan of Train you, no doubt, already knew the names of the wines related to their albums and most successful songs. So they definitely are not weird, but wonderful. 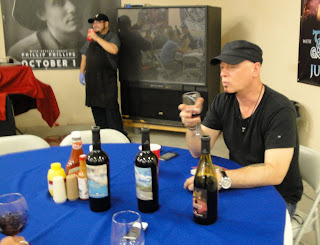 The other two current wines are the 2011 Calling All Angels Chardonnay and 2011 Drops of Jupiter Red, a red blend that is primarily the Petite Sirah grape. All wines are $12, a very good price for this quality. I do hope to try these soon, as well. I also learned about the band’s involvement in Family House, a non-profit organization providing temporary housing to families of seriously ill children in the San Francisco Bay area. The band makes a donation to Family House for each bottle of wine sold. As Jimmy said, “we wanted to give back to the Bay area.” Some folks say that and it sounds self-serving, but in this case they really mean it and back it up with visits to see and interact with the children and their families. There is even a Train “music room” for the countless musical instruments the band has donated. Later we went out to join the thousands of fans enjoying the concert. Even the grass fields above the stage and fixed seating were full. 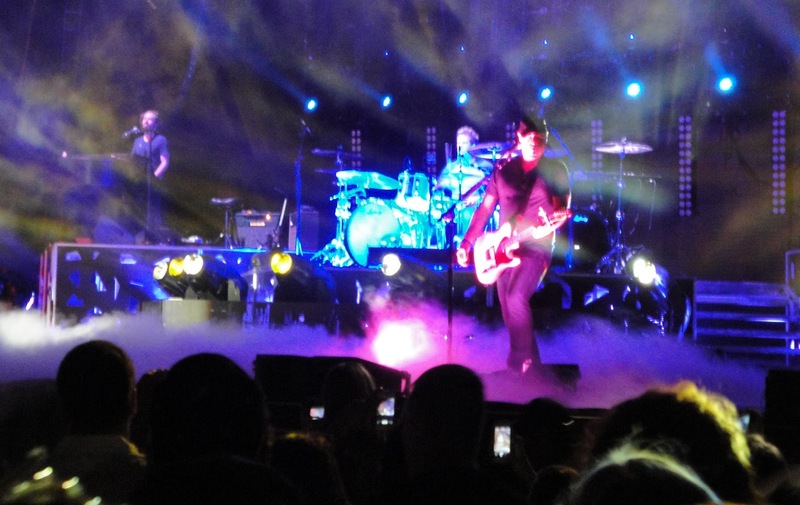 Lots of families, too, which is something Jimmy really likes about their concerts. Not only do they help Bay area families, they help fans and families around the world. And now they have signature wines to represent another aspect of the band. When I finally got to see Jimmy in action I had to admit; he plays a damn good guitar, too. Rock on guys, and wine on, too and thanks for all the memories. This will be my last post on the present website. I’ll be moving to much nicer digs soon, with a better, more interactive website I think you’ll love. If this does not appear to be a typical wine blog, it isn’t. But my family reunion in Cape May, NJ revolved around food and wine. Actually it used to revolve around mostly food, but as the younger generation married and began a family it included wine, spirits and beer as well. And no, it wasn’t just my influence as we had wonderful input on wine from many in the family. There were 23 of us in one house, but it was a really big house with a really big dining room that held two long formal dining tables, which we filled with the many meals we made together. I lost count of how many times one of the parents was looking for a child in the house. It was that big. The home was on Beach Avenue, Cape May at the east end with great views of the beaches west and north. The kitchen was also very big, and with several cooks in our family that was a selling point. We went through several bottles of Chilean and New Zealand Sauvignon Blanc and a goodly amount of Riesling. All good wines for the seafood we regularly enjoyed. This was the Jersey Shore, after all. When it came to pizza, burgers and such, we indulged in Argentinean Malbec and Chilean Cabernet Sauvignon. Occasionally we went with California and Washington wines, but southern hemisphere wines are still a good bet for the price and we had a lot of glasses to fill. Our first Sunday after arriving was a Thanksgiving dinner with two turkeys and all the trimmings. Why Thanksgiving? Well that is when most of our reunions occurred in the past and my family like to plan big elaborate meals. July Fourth saw us all working as a team to make the clam’s ala casino. The recipe here is different from ours, but I can’t disclose our family recipe. I did sign a non-disclosure after all! The main ingredient is fresh clams that are shucked to begin the process. When you have six dozen, you need a lot of help. We added the Jersey fluke (summer flounder), Jersey tomatoes and corn and we were in heaven. It’s called “a Jersey shore dinner”. The only time we went out to eat was our last evening before returning home. 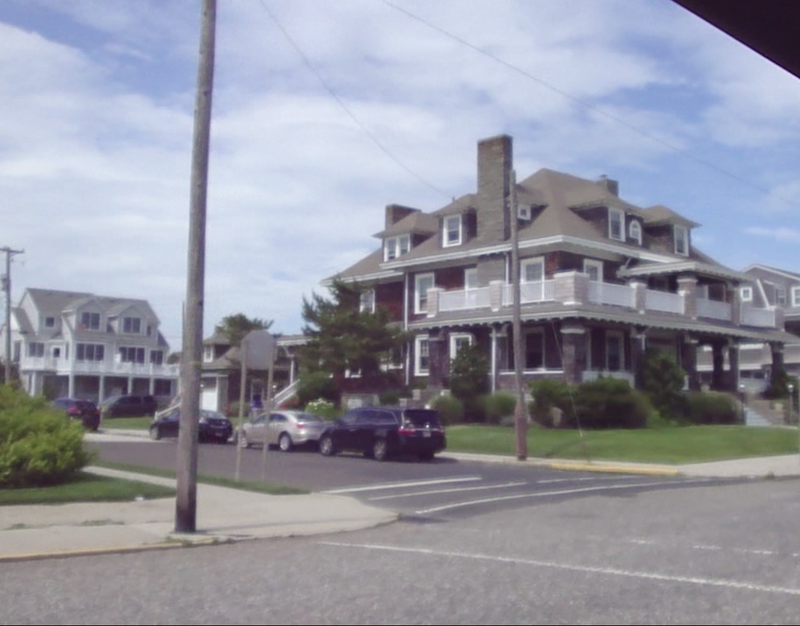 The Inn of Cape May is a landmark at the Cape. If one wants to imagine this town of Victorian mansions in the early 20th century, this is a good place to begin. In fact there are more Victorians here than any other city including San Francisco. The food is good and well-priced and they have a decent wine list. We also had most of the main dining room to ourselves and the staff was wonderful as always. I started with a very good Caesar salad that I shared with my grandniece, Ava. Actually I didn’t know I was sharing it until she dipped her fork into it. Fortunately for her she has a high cuteness index so I indulged her. After cocktails we ended up with a very good Sauvignon Blanc wine from Chile, Carta Vieja. Chilean “costa” Sauvignon Blanc wines are not as intense as those of New Zealand, but represent very good value. This 2012 Sauvignon Blanc boasts racy grapefruit, gooseberry and grassy aromas that come through on the palate with lime and lemon and balanced by good acidity. We went through a few bottles with our dinner. If made for a wonderful farewell dinner and our last night on the Jersey shore and evoked the many years our family had gone to Manasquan, NJ and spent summer vacation with our grandparents. Now we are the grandparents continuing the tradition. San Francisco is a Mecca for food and wine lovers and the ones I selected were great destinations. I paired each entrée with some very good wines that are described herein. Some of these are old favorites; others are new favorites in a week of dining successes. My wife, Barbara, and I arrived late Monday morning and traveled by taxi to Powell Place atop Nob Hill and then back across the bay by BART to Oakland for dinner with our friend Enid. This is a very trendy area of Oakland near Berkley. To survive here a restaurant has to know its audience. That means dining al fresco will generate business and so will an eclectic menu. Good wine for sophisticates is also a good idea as Napa is just up the road. My chicken breast with wild mushrooms, fennel and quinoa went perfectly with the 2011 Finca Las Nubes Torrontés from Argentina. This was a new Torrontés for me and one of the better whites to come out of Argentina. This is a highly rated Torrontés with an 89 to 91 point score. Jose Luis Mounier is a reputed master of this grape and the wine shows a fine hand crafted it. The wine is elegant with good balance, showing flowery aromas and flavors of jasmine and orange blossom, with wonderful minerality and juicy acidity. This is a food-friendly or just-drinking-alone wine that will pair with many foods including Asian cuisine. No trip to Baghdad by the Bay is complete without a sake sampling session. I found a couple of new favorites at three of my go-to Japanese restaurants. Maru Sushi is a long time favorite two blocks down from our timeshare on Powell. Good sushi and a good selection of sake keep us coming back. I ordered a small bottle (300ml) of Ozeki Karatamba Sake. Karatamba means dry wave and this is fine dry sake of medium body with clean, smooth flavors. The rice is milled to 70% and the subtle rice flavors permit pairing with a wide range of Asian fare. The following day we met friends at Hana Zen, my favorite Japanese restaurant in San Francisco. Nestled in a corner of the Hotel Nikko, Hana Zen has great sushi and even better yakitori, a Japanese cooking method where meats and vegetables are skewered and grilled. Technically the term is Kushiyaki as yakitori means only chicken meat, but the terms are used interchangeable; less to remember that way. I again went with the Karatamba, one because I liked it so much, two because it was well-priced, and three because it was fun to say; Kara-tamba! Sanraku Japanese restaurant is in the Metreon complex near Moscone Center. We went to see the movie 42, which was outstanding, with our friends Ken and Debbie McKenzie. The food again is excellent and the outdoor seating on a pleasant May day in San Francisco is not to be missed. Summer in the city is a different experience as the central valley heat mixes with the Pacific coastal breezes and the fog obliterates the sun. “The coldest winter I ever spent was a summer in San Francisco,” was alluded to Mark Twain, but was his most famous non-quote. Twain actually complained a lot about Paris weather, but not so much about San Francisco. But I digress. I had the sake sampler along with a salad, gyoza and the oyster special. The Junmai Otokoyama (“Man’s Mountain”) and Ginjo Kikusui (“Chrysanthemum Water”) were my favorites. The Kikusui held notes of a distant sea breeze and was one of the most delicate sakes I’ve tried. I might mention here that all these cold sakes are 15% to 15.5%. Some climb up to 16.5%, so be aware while you are enjoying these elegant sakes you can also get hammered if you don’t watch it. The relatively coarse hot sakes will do the trick even faster, but it would be a crime to heat premium sake. If you came here from my newsletter, it was probably to check out this item. And yes there is a monkey, but I’m not cleared to discuss it. Mary Ellen and Michael joined us here Friday. They came in on Caltrans, which all of us Bay-area denizens use rather than driving into the city, and worse, trying to find a parking spot. The train terminates near AT&T Park, where thousands of Giant’s fans are disgorged to find their way to the ballpark or populate the local bars. As it happens some of them made it to Koh Samui so we had to wait a long time to get our cocktails. I had the Cilantro Margarita, which was so good I’m going to make them for my local friends. The scallop satay was criminally good and the Madame Sea Bass had just about the best green curry I’ve tasted to go with the bass. I originally ordered the Eroica Riesling, a joint effort by Dr. Loosen of Germany and Chateau Ste. Michele one of the best Riesling houses in the country. They were out! But disappointment turned to astonishment when I tasted the 2010 Salomon Undhof Kögl Riesling the waitress recommended. Riesling wines typically go with Asian cuisine, which is why I stuck with this grape, but this wine was made for Thai cuisine. Kudos to Koh Samui for having two great Riesling wines on the menu. Heck they may have even more, but I’d choose this wine every time given the option. If you noticed the glass stopper next to the glass, I’ve been seeing more of these fasteners of late. It has a rubber seal over the glass and makes a great backup stopper. I recycled mine to use at home; a bonus from Salomon. The service is uneven but it was Friday night and a Giant’s home stand against the Atlanta Braves as well. (The Giants took 3 out of four games.) Still with our good friends the time went by all too fast. Vertical tasting of wine normally assumes different years of the same winemaker are being tasted, but I wanted to contrast two wines with similar pedigree and contrast a relatively young wine with a much older one. I also had a family pack of NY Strip steaks to cook, but no family around so I invited good friends Don and Jan Swanson. When they arrived we served Caviar on Neufchatel and Endive Tips and Dusted Calamari on our rear deck, even though canyon winds were threatening. Well, they always threaten when we sit down to eat outdoors. I popped the cork on a Gruet Blanc de Noirs, which fit the bill perfectly for both appetizers. While the Swansons enjoyed the changing colors of the Sandia Mountains, I fired up the grill. The NY Strips had marinated for 24 hours in a Milagro Zinfandel-based marinade and stayed moist even with the high heat of the grill. Meanwhile my wife, Barbara prepared one of her specialties; Blackened Brussels sprouts, which cook on high heat until blackened. Although that might not sound appealing, even Brussels sprouts-phobic guests love it. Since Don had come in the Captain Don tee shirt I’d given him after my last Hawaiian trip, I thought it only fair if I put mine on as well. I’m not sure Barbara fully approved by changing a St. James French pullover for a tee, but maybe it’s just a guy thing. Deciding not to tempt fate and the Sandia winds we went inside for the remainder of dinner. We began the main course with a 2001 Burgess Cabernet Sauvignon. It had thrown off enough sediment I decided to decant it rather than use the Wine Breather. (More on that later.) Elegance and structure are part of this wine’s charm, and the fruit was lush and deep. The wine paired with the steak, no surprise there, but also with the rice pilaf and Brussels sprouts. I did use the Wine Breather on a 2008 Ceja Cabernet Sauvignon that followed the Burgess. The Cab was still a bit unruly so I poured it into a carafe. It continued to open, exposing cocoa, dark cherry and cinnamon and as lush a set of tannins as I’ve ever tasted. I finished the wine with New Zealand sharp cheddar, before indulging in the dessert I made. That was strawberries soaked in a Santa Fe Vineyards Malvasia Blanco and then poured over French vanilla ice cream. Once I saw the sediment thrown off by the 12 year old Cab, I knew doing a flash decant or using an aerating device (e.g. Vinturi) that agitated the tannins and sediment would not be the best approach. This is where one has to plan ahead, since wines can always throw off sediment and older wines are always more likely. I used a true decanter that can be tilted to the proper angle to slowly pour the wine, always watching for the drift of sediment. The much younger Ceja Cab from Carneros did not require decanting so the Wine Breather facilitated the opening of that wine. The order also proved to be correct and the difference of 7 years aging was quite significant. I discuss wines of the world, but also focus on wines of the Southwest. I always look for good wine values. Look for titles such as shown below, which will be added sporadically after I find great new wines under $10 and under $20. Priceless wines will appear less often because I can''t afford them. Since I reside in the Southwest this seemed like a good moniker. I've been a professional writer for over 35 years, first in high tech, later with my first published novel, The Phoenix Society, which is set in Sonoma wine country. I'm currently working on a novel about the Lincoln County wars of the late 1870's in Lincoln, NM. My second wine book, Wines of Enchantment: The Centennial Edition will be available on Amazon.com in April 2012, or many local NM wineries. I plan more wine books within the southwest region. 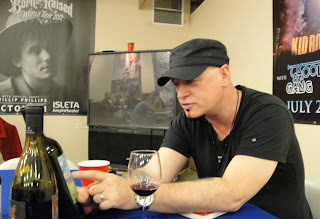 I also write screenplays and use screenwriting techniques in my novels. I'm also a movie nut (big surprise), and a bicyclist, having cycled much of North America and Europe. As the Wine Maestro I set up wine dinners and wine tasting, give talks on wine, and wine classes. I currently do wine classes for Road Scholar and wine presentations for hire. I'm also the Albuquerque Wine Examiner (Examiner.com) writing about wine, of course.